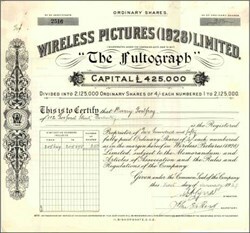 Beautifully engraved certificate from the Wireless Pictures (1928) Limited issued in 1929. This item is hand signed by the Company’s Director and Secretary and is over 82 years old. It has an ornate side border with the company's name and the product name "The Fultograph" printed on top. You know, of course, that since the 15th October last year Radio Wien has been broadcasting pictures in order, at least partly, to complete optically the ordinary broadcasts. The somewhat high price of the necessary apparatus, and the relative crudeness of the results achieved at first, were the reasons that not many people availed themselves of this service. But since the middle of January of the present year the method of transmission has been improved to such a degree that now, for the first time, it is possible to transmit pictures of all kinds... any photographic negative whatever may be broadcast by radio as soon as it has been developed. Despite improvements in the reproductive capacity of this process, it did not win public acceptance. At the onset of the Depression the promise of a few pictures a day could hardly have offset the cost involved in acquiring the necessary equipment, especially when universal ownership of a radio was far from being achieved in even the most developed countries.